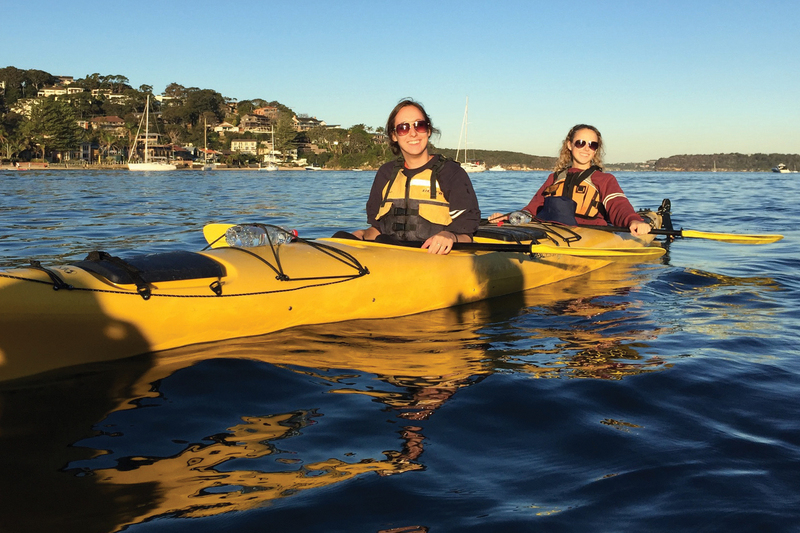 Juniors in education Rachel Granzin (left) and Lindsay Duffy go kayaking near Sydney during a study-abroad trip to Australia. dance” when she learned she’d be studying abroad Down Under. Duffy, a 20-year-old elementary education major from Orland Park, Illinois, was among 26 education students who studied abroad in Australia this past summer. As with previous study trips organized by the College of Education that took Illinois students to destinations such as Argentina, China and South Africa, each participant received a $500 scholarship toward their travel expenses. Arriving in Australia on June 12, the group traveled down the continent’s east coast, beginning in Cairns and ending in Canberra three weeks later. Along the way, they visited several public and private primary and secondary schools, as well as education colleges at several partner universities, to learn about Australia’s education systems and teacher preparation programs. For Colleen Ross, one of the highlights of her trip occurred the third day, when she conversed briefly in German with a classroom of second-graders while the group was touring a private school outside Brisbane. During these school visits, the Illinois students conducted research on various aspects of Australian education, such as classroom design or promoting inclusivity, and used their cellphone cameras to document their findings. At the end of the trip, the students presented their findings to U. of I. education professors Bill Cope and Mary Kalantzis, who also is the college dean. The married couple were in Canberra to give a keynote presentation at a literacy conference, one of two symposia the students attended while abroad. Johnell Bentz, a special education faculty member who accompanied the group to Australia, was a keynote speaker at a teachers’ conference in Sydney, which the group attended as well. While in Canberra, the students spent two days shadowing teachers in their specialty areas at Lanyon Cluster Schools. Duffy taught mathematics to fourth-graders, while Ross worked with first-graders – and said she couldn’t stop smiling when she indulged her “childlike heart” by joining the children in a hip-hop dance lesson. “Although there were prominent and interesting differences between the schools we’ve experienced in Australia and ones we know back home, being at the school today further helped me realize that kids are kids and school is school, no matter where in the world you are!” Ross wrote on the trip blog. The travelers also eagerly explored Australia’s stunning geographical and cultural assets: They splashed in rainforest waterfalls, cuddled koalas at an animal sanctuary, viewed aboriginal art at the National Gallery and learned spear-throwing and fire-starting skills from an aboriginal tribal elder. clam on the ocean floor. techniques they might use with their own students, said Assistant Sean Susan Michaels, who created the itinerary and chaperoned the group, along with Assistant Dean for Student Affairs Kathleen Ryan, Bentz and graduate student Jamie Pearson.